The apartment is located in the central location directly in Friedrichshafen. The city Friedrichshafen offers very good bus connections to the fair (without change 5 min), the bus stop is directly in front of the house, but also on foot one is in 20 minutes at the destination. The Bodenseeufer can be reached on a pedestrian walk in 15 minutes. Just 2 minutes walk from the apartment there is a large shopping center with coffees, several restaurants and bars, a bakery that is also open on Sundays. The entertainment venues such as bowling, cinema, gym, Sonnenstidio are in the immediate vicinity. The apartment has just been completely renovated and is located on the 1st floor. Through the large window it is very bright in the apartment. The apartment has a living space of 50 sqm, is fully furnished and functional. There is a living room with a sofa bed, a double bed and a fitted kitchen, a balcony and a bathroom. The apartment can accommodate up to 4 adults and a baby. The cot and high chair is available on request for a fee. The apartment is furnished with brand new furniture. The fitted kitchen has a cooker with ceramic hob and oven, a fridge-freezer, a microwave and a dishwasher. There is also a pad coffee machine (Philips Senseo), a toaster and a kettle. The tea towels, bath towels, towels and bed linen are also provided. A flat screen TV. Smoking in the apartment is not allowed. There is a parking space on a parking lot reserved for you in the yard at the house. Visitors who bring their own bicycles, can complete their bikes in a separate basement room. WiFi usage is free. Upon request, guests can be picked up from the airport or train station. I was only in town for a couple of days visiting my nephew who is doing an internship in Friedrickshafen. Perfect apartment and an awesome time in this wonderful city Will definately rent this apartment again and can highly recommend it. Thank you very much for good Review, you are happy to welcome me. It is a very nice holiday appartment, I like it very much! It is in the near of Frierderichshafen shopping centrue, and also not far away form the station. Mrs. Menzer is very kind and helfful. If I travel again in this area, I would like to stay at this lovely appartment again! Velen herzlichen Dank für die positive Bewertung. Sie sind bei mir gerne willkommen. Agradable casa, bien decorada y equipada. La dueña muy amable y educada. Die Wohnung ist schön. Schlicht ohne viel Tünnef, die Küche hat das nötigste. Schön ist der Parkplatz im Hof, sonst hat man keine Chance einen zu finden. Das Bad ist leider ohne Fenster, aber wunderschön und bekommt in Sauberkeit 5 Sterne!!! The apartment is located in the central residential area directly in Friedrichshafen. The city of Friedrichshafen has very good bus connections to the fair without changing trains in 5 minutes, the bus stop is right in front of the house, but also on foot in 20 minutes. one is at the destination. The shores of Lake Constance can be reached on a footpath in 15 minutes, or by bus to the old town. Located only 2 minutes there is a huge shopping mall with booths, several restaurants and bars. Bakery has also opened Sontag and entertainment facilities such as bowling, cinema, gym, solarium. The apartment was just completely renovated and located on the 1st floor. Through the large windows it is very bright and warm in the apartment. 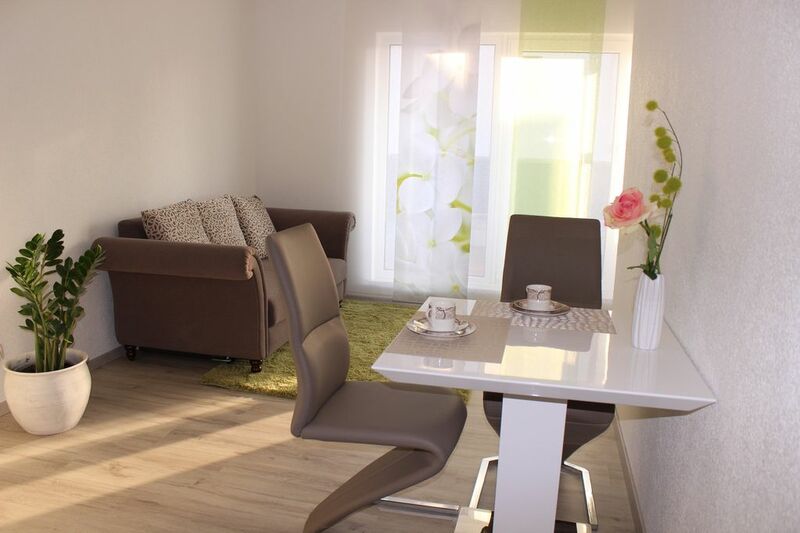 The Appatement has a Wohfläche of about 50 sqm is fully and functional. The apartment is furnished with all new furniture. The kitchen has a cooker with ceramic hob and oven, a fridge freezer, a Mickrowelle and a dishwasher. Moreover, a Padkaffemaschine and a toaster and a kettle is available. Dish towels, bath towels, towels and sheets are also provided. A flat-screen TV, iron and ironing board are also provided. Smoking in the home is not permitted. There is parking on reserved for you parking in the yard direrkt at home. Visitors bring their own bicycles, your wheels can take out in a separate basement room. Wifi use for free. On request, guests from the airport or train station can be picked up.